Gandhi in South Africa in 1909.
measured by the way in which its animals are treated." Mohandas Karamchand Gandhi 2 October 1869 - 1948 was born in Porbandar, a coastal town in present-day Gujarat, India. He was commonly called by the honorific Mahatma Gandhi, which means great soul, first applied to him by Rabindranath Tagore. Officially honoured as the father of India, Gandhi was the pre-eminent political and spiritual leader during the Indian independence movement. He was a champion of Satyagraha, ('devotion to truth') a nonviolent way to address wrongs by peaceful civil disobedience based upon the philosophy of ahimsa - nonviolence. You can read more about Ahimsa further down. In 1888 he travelled to London England to study law and train as a barrister after which he returned to India accepted a job at an Indian law firm in Durban, South Africa were he spent twenty years, during which time he was sent to prison many times. Appalled by the treatment of Indian migrants in south Africa he join the struggle to obtain for them basic rights. Eventually the South African government conceded to Gandhi's demands in 1914. Gandhi is however most famous for his non violent protests against British rule In India and by 1920 Gandhi became an important figure in Indian politics most notable of which was his programme of non violent non-cooperation with the British which included boycotts of British goods and institutions .For his various activities in the endeavour for Indian independence Gandhi was sentenced to six years in prison but realised after serving just two years. After which he devoted himself to improving the relationships between Hindu and Muslims. Eventually the two independent states of India and Pakistan were formed. Gandhi was opposed to this petition and on 30th January 1948 he was assassinated. Gandhi though is considered by many as more of a philosopher than a statesmen. Often overlooked however is that Gandhi's commitment to peace also included non human animals and Gandhi was one of his eras great advocates of vegetarianism. During his time in London he joined and was a member of the executive committee of the vegetarian society which was established 1847 with the aim of promoting understanding and respect for vegetarian lifestyles. As a member of the society he published several articles in various newspapers defending vegetarianism. Gandhi also continued his journalist support of vegetarianism during his time in South Africa. I read Salt's book from cover to cover and was very much impressed by it. From the date of reading this book, I may claim to have become a vegetarian by choice. I blessed the day on which I had taken the vow before my mother. I had all along abstained from meat in the interests of truth and of the vow I had taken, but had wished at the same time that every Indian should be a meat-eater, and had looked forward to being one myself freely and openly some day, and to enlisting others in the cause. The choice was now made in favour of vegetarianism, the spread of which henceforward became my mission. Gandhi was committed to Ahimsa, a Sanskrit term which means to do no harm, to avoid violence, literally: the avoidance of violence - himsa. (Removal of the "A" gives the word opposite meaning. Himsa literally means 'violence' in Sanskrit, Hindi and other Indian languages including Gujarati, Marathi, Telugu and Tamil). It is a rule of conduct that prohibits the killing or harming of any living being. Ahimsa is an important part of all the religions that originated in ancient India including Buddhism, Hinduism and most particularly Jainism. Gandhi lived a rather austere lifestyle sustaining himself upon a simple vegetarian diet, often undertaking long periods of fasting as a means of self purification and as a way of making a statement of social protest. At his death he had a few possessions. 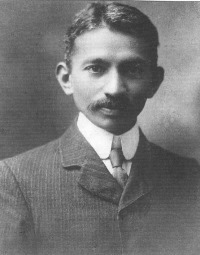 Gandhi believed that violence was an innate part of any type of exploitation. If we are to be non-violent, we must then not wish for anything on this earth which the meanest or the lowest of human beings cannot have. nonviolence to all animals and an advocate of ahimsa said Gandhi "shuns to the best of his ability the destruction of the tiniest creature." "Ahimsa is a comprehensive principle. We are helpless mortals caught in the conflagration of himsa. The saying that life lives on life has a deep meaning in it. Man cannot for a moment live without consciously or unconsciously committing outward himsa. The very fact of his living - eating, drinking and moving about - necessarily involves some himsa, destruction of life, be it ever so minute. A votary of ahimsa therefore remains true to his faith if the spring of all his actions is compassion, if he shuns to the best of his ability the destruction of the tiniest creature, tries to save it, and thus incessantly strives to be free from the deadly coil of himsa. He will be constantly growing in self-restraint and compassion, but he can never become entirely free from outward himsa. Gandhi became an ardent vegetarian to the extent that he told the Vegetarian society that he would choose death rather than eat meat: "If anybody said that I should die if I did not take beef-tea or mutton, even under medical advice, I would prefer death." Gandhi believed that the practice of vegetarianism for moral reasons rather than for health was essential to the vegetarian cause; he believed that those who were vegetarian solely for health reasons were less likely to keep to their commitment while those who did so for ethical reasons were more likely to continue to adhere to a vegetarian diet. Below is a selection of various writings of Gandhi advocating vegetarianism. In the letter which follows Gandhi maintains that vegetarianism is conducive to not only physical wellbeing in the form of improved health but also spiritual wellbeing. Mr. Gandhi is just as busy at work in Natal on behalf of Vegetarianism as he used to be in England. The following valuable letter which he contributed to the Natal Mercury is worth reproducing both for its intrinsic value and as an incentive to others to follow in Mr. Gandhi's footsteps in stirring up the public by means of the press. "Sir, - As one interested in food reform, permit me to congratulate you on your leader in Saturday's issue on "The New Science of Healing," which lays so much stress on the adoption of the natural food, i.e., Vegetarianism. But for the unfortunate characteristic of this 'self-indulgent' age in which 'nothing is more common than to hear men warmly supporting a theory in the abstract without any intention of submitting to it in practice,' we should all be Vegetarians. For why should it be otherwise when Sir Henry Thompson calls it 'a vulgar error' to suppose that flesh-foods are indispensable for our sustenance, and the most eminent physiologists declare that fruit is the natural food of man, and when we have the example of Buddha, Pythagoras, Plato, Porphyry, Ray, Daniel, Wesley, Howard, Shelley, Sir Isaac Pitman, Edison, Sir W. B. Richardson, and a host of other eminent men as Vegetarians. The Christian Vegetarians claim that Jesus was also a Vegetarian, and there does not seem to be anything to oppose that view, except the reference to His having eaten broiled fish after the Resurrection. The most successful missionaries in South Africa (the Trappists) are Vegetarians. Looked at from every point of view Vegetarianism has been demonstrated to be far superior to flesh-eating. The Spiritualists hold, and the practice of the religious teachers of all the religions, except, perhaps, the generality of Protestant teachers, show that nothing is more detrimental to the spiritual faculty of man than the gross feeding on flesh. The most ardent Vegetarians attribute the agnosticism, the materialism, and the religious indifference of the present age to too much flesh-eating and wine-drinking, and the consequent disappearance, partial or total, of the spiritual faculty in man. Vegetarian admirers of the intellectual in man point to a whole host of the most intellectual men of the world, who were invariably abstemious in their habits, especially at the time of writing their best works, to demonstrate the sufficiency, if not the superiority, of the Vegetarian diet from an intellectual standpoint. The columns of the Vegetarian magazines and reviews afford a most decisive proof that where beef and its concoctions, with no end of physic thrown in, have lamentably failed, Vegetarianism has triumphantly succeeded. Muscular Vegetarians demonstrate the superiority of their diet by pointing out that the peasantry of the world are practically Vegetarians, and that the strongest and most useful animal, the horse, is a Vegetarian, while the most ferocious and practically useless animal, the lion, is a carnovora. Vegetarian moralists mourn over the fact that selfish men would - for the sake of gratifying their lustful and diseased appetite - force the butcher's trade on a portion of mankind, while they themselves would shrink with horror from such a calling. They moreover lovingly implore us to bear in mind that, without the stimulants of flesh-foods and wines, it is difficult enough to restrain our passions and escape Satan's clutches, and not to add to those difficulties by resorting to meats and drinks, which, as a rule, go hand in hand. For it is claimed that Vegetarianism, in which juicy fruits find the foremost place, is the safest and surest cure for drunkenness, while meat easily induces or increases the habit. They also argue that since meat eating is not only unnecessary, but harmful to the system, indulgence in it is immoral and sinful, because it involves the infliction of unecessary pain to and cruelty towards harmless animals. Lastly, Vegetarian economists, without fear of contradiction, assert that Vegetarian foods are the cheapest diet, and their general adoption will go a long way towards mitigating, if not altogether suppressing, the rapidly growing pauperism side by side with the rapid march of the materialistic civilisation and the accumulation of immense riches in the hands of a few. So far as I recollect, Dr. Louis Kuhne urges the necessity of Vegetarianism on physiological grounds only, and does not give any hints for beginners, who always find it difficult to select the right kinds from a variety of Vegetarian foods, and to cook them properly. I have a selection of Vegetarian cookery books (at from 1d. to 1s. ), as also treatises on the subject dealing with its various aspects. The cheapest books are given away, and if any of your readers feel disposed, not merely to admire the new science of healing from a distance, but to put its tenets into practice, I shall be very glad to supply them with what pamphlets I possess on the subject, so far as it relates to Vegetarianism. These things may be far off yet for the whole world. But why cannot those who know and can - the Christians - enact them for themselves at any rate? There can be no harm in anticipating them, and maybe thereby their approach may be considerably hastened. There appears to be some similarities between the letter to the Natal Mercury and the first section of the following writings, the first eight paragraphs of which are the same. I have therefore included the following extract from the second section. Therefore, I think that what vegetarians should do is not to emphasise the physical consequences of vegetarianism, but to explore the moral consequences. While we have not yet forgotten that we share many things in common with the beast, we do not sufficiently realise there are certain things which differentiate us from the beast. Of course, we have vegetarians in the cow and the bull -- which are better vegetarians than we are - but there is something much higher which calls us to vegetarianism. Therefore, I thought that, during the few minutes which I give myself the privilege of addressing you, I would just emphasise the moral basis of vegetarianism. And I would say that I have found from my own experience, and the experience of thousands of friends and companions, that they find satisfaction, so far as vegetarianism is concerned, from the moral basis they have chosen for sustaining vegetarianism. In conclusion, I thank you all for coming here and allowing me to see vegetarians face to face. I cannot say I used to meet you forty or forty-two years ago. I suppose the faces of the London Vegetarian Society have changed. There are very few members who, like Mr. Salt, can claim association with the Society extending over forty years. During these days I walked up and down the streets of Calcutta. I went to most places on foot. I met Justice Mitter and Sir Gurdas Banerji, whose help I wanted in my work in South Africa. And about this time I met Raja Sir Pyarimohan Mukarji. Kalicharan Banerji had spoken to me about the Kali temple, which I was eager to see, especially as I had read about it in books. So I went there one day, Justice Mitter's house was in the same locality, and I therefore went to the temple on the same day that I visited him. On the way I saw a stream of sheep going to be sacrificed to kali. Rows of beggars lined the lane leading to the temple. There were religious mendicants too, and even in those days I was sternly opposed to giving alms to sturdy beggars. A crowd of them pursued me. One of such men was found seated on a verandah. He stopped me, and accosted me: 'Whither are you going, my boy?' I replied to him. He asked my companion and me to sit down, which we did. I asked him: 'Do you regard this sacrifice as religion?' 'Who would regard killing of animals as religion?' 'Then, why don't you preach against it?' 'That's not my business. Our business is to worship God.' 'But could you not find any other place in which to worship God?' 'All places are equally good for us. The people are like a flock of sheep, following where leaders lead them. It is no business of us sadhus.' We did not prolong the discussion but passed on to the temple. We were greeted by rivers of blood. I could not bear to stand there. I was exasperated and restless. I have never forgotten that sight. That very evening I had an invitation to dinner at a party of Bengali friends. There I spoke to a friend about this cruel form of worship. He said: 'The sheep don't feel anything. The noise and the drum- beating there deaden all sensation of pain.' I could not swallow this. I told him that, if the sheep had speech, they would tell a different tale. I felt that the cruel custom ought to be stopped. I thought of the story of Buddha, but I also saw that the task was beyond my capacity. I hold today the opinion as I held then. To my mind the life of a lamb is no less precious than that of a human being. I should be unwilling to take the life of a lamb for the sake of the human body. I hold that, the more helpless a creature, the more entitled it s to protection by man from the cruelty of man. But he who has not qualified himself for such service is unable to afford to it any protection. I must go through more self-purification and sacrifice before I can hope to save these lambs from this unholy sacrifice. Today I think I must die pining for this self-purification and sacrifice. It is my constant prayer that there may be born on earth some great spirit, man or woman, fired with divine pity, who will deliver us from this heinous sin, save the lives of the innocent creatures, and purify the temple. How is it that Bengal with all its knowledge, intelligence, sacrifice, and emotion tolerates this slaughter? "We must be the change we wish to see in the world. (and) I hold that, the more helpless a creature, the more entitled it is to protection by man from the cruelty of man." I do feel that spiritual progress does demand at some stage that we should cease to kill our fellow creatures for the satisfaction of our bodily wants. I hold flesh-food to be unsuited to our species. We err in copying the lower animal world if we are superior to it.